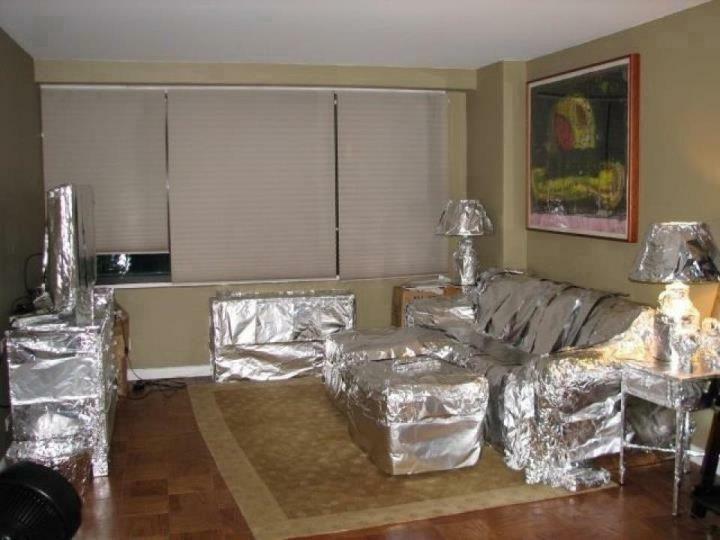 i live in an apartment building with 95% jews. it is always a challenge to find a shabbos goy. often frum tenants mistake non-frum tenants for non-jews. more than once i have saved people from the embarrassment as well as averah of asking a jewish person to be a shabbos goy. aside from those who are actually jewish there are those who think they are jewish who live in my apartment building. there is a woman who does not look like your typical ashkenazic jew who is married to a non-frum jewish man in my building. she wears a jewish star and always speaks about the jewish holidays. she even wishes everyone a good holiday when a jewish holiday comes up. even though she may not actually be jewish i would never ask her to be a shabbos goy. it would embarrass her regardless of the validity of her jewishness. the other day i saw her with a new hairstyle which she told me was a sheitel (exact word) and that she is getting in touch with her jewish roots. i had not realized it was a wig, but had i thought it was a wig and she did not mentioned the jewish part i would have worried that she was ill. she also was wearing a skirt, but until she mentioned the jewish part i wouldn't have given it much thought. women wear skirts . i went on to wish her a good shabbos . what is really funny is that though she is from a foreign country she is from a foreign country where i know jews exist, its just that i never had assumed that she was actually jewish by birth. i still do not know if she is a convert or if she was actually born jewish. i would never ask anyone this type of question because she is a neighbor and it is irrelevant. there was never any reason for me to know either way. she may end up having a proper conversion, she may already actually be jewish. unless she tells me (or if i hear it from the grapevine) i will not know. many times i have met people and assumed that they were not jewish and they in fact were. i think that it is much harder to find a shabbos goy than one really thinks. sometimes being single can kind of be like endless summer. there is always a party to go to. there is always someone else to meet. i have met a lot of people who get caught up in all of the fun that they forget about moving forward. summer isn't the only season that is enjoyable. i for one am sick of summer. freedom is fun, but its nice to be coupled. it might not always be summer or one long frat party , but i am ready for a change of season. after all the parties i have attended i have learned that parties are not all that and best in moderation. a lot of people are all or nothing people . they are either perfect or horrible and nothing in between. unfortunately for them life is rarely clear cut. i heard the following analogy in regards to weight loss, but it can really be applied to everything in life. lets say you have a carton full of eggs and by the time you get home from the store you realize that you have broken one of the eggs. would you just continue breaking the rest of the eggs because after all one egg is broken and you no longer have a full carton of intact eggs? i will answer this one. of course you would not continue to break the rest of the eggs. you would just have to make the most of the remaining eleven eggs until you went to the store again and bought another dozen eggs. just because a person might break their diet one day does not mean they should throw in the towel. sometimes people fail but this does not eradicate the rest of ones victories. try to look at the big picture. just because things aren't perfect does not mean the goals aren't worth striving for even if they may take long to achieve. never underestimate the power of perseverance. in honor of israeli independence day i am posting this video. happy yom ha'atzmaut! happy israeli independence day!! happy 64th birthday to the state of israel!! this clip is in memory of the fallen israeli soldiers. we will never forget any of you. this photo says it all. 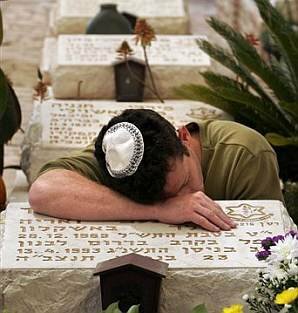 this is in memory of all the sons, fathers, cousins and friends who have lost their lives defending the state of israel. i would also like to add another word about yom hazikaron in israel. i think that it is amazing how in israel the day before celebrating independence day we take a day to remember all who have fallen defending the land of israel. the united states has a memorial day as well, but it is a month before july fourth. having the two days one after the other makes the celebrating bittersweet. it also accentuates how much we should not take the state of israel for granted in order that those who have fallen will not have done so in vain. Time-Lapse of a Girl from Birth to Age 12 this is such a cool video. a father took videos of his daughter from the time she was a baby until twelve years old and compiled them into a time lapse video. its very cool. it is also kind of sad to see how a baby grows up before your eyes. maybe she's born with it, maybe its photoshop!!! in light of all the recent plastic surgery talk i just had to post this video. i know a lot of people who have done plastic surgery and they don't always look better. i am not talking about someone with medical need for plastic surgery or plastic surgery to fix a burn victim. i am speaking about women who are aging and constantly going under the knife. once a person goes the plastic surgery route it is hard to stop. the best way for everyone to look better to one another is for everyone to just stop wearing glasses. without wearing one's glasses it is amazing who will start looking attractive! in 1950's america women were housewives and men were the breadwinners. though i don't want to go back to the 1950's i do admit that the roles of the sexes was easier. everyone knew what one's roles were. now things are a lot more complicated. not only do men want women to work they often want a woman who makes a lot of money. oh and most of the child care duties are still performed by the mother. there all also women who are so independent that they do not want to be beholden to their husbands financially so much so that they will refuse to use his money because it would be relying on him too much. there are other women who would prefer to be the sole breadwinner of the family because then they are in control and not reliant on a man. i think that the ability to support ones self financially is important for women as well as men. money means power so i can see how women want to financial independence . this financial independence should not however get in the way of being able to share in a marriage situation. i have never been married, but i definitely see this as an issue. i think that a lot of women are trapped in bad marriages because they have children and cannot support themselves if they do not remain married . sometimes a husband dies and if the wife does not have a strong income source she will be in trouble. everyone spends money differently. when one marries one has to make sure they know what the other person's spending habits and style is otherwise one could have a very unpleasant surprise. there is a yiddish saying that i would quote in the original yiddish if i spoke yiddish so i will share this proverb with you in english. man plans and g-d laughs. so often i visit friends with children who talk about how in x amount of years their kids will be married and when specifically they will become grandparents. i always laugh . we plan for a lot of things to be achieved by a certain timetable and things don't always go according to as planned. sometimes this is for the better and sometimes not. i suppose i laugh to myself instead of aloud because i feel that others will think that i just find this funny because my life hasn't gone according to my original plans. others would doubt my opinion because heck only my life hasn't gone according to plan but theirs has. they married by age x and had kids by age x. their lives have moved smoothly forward and they think that their kid's lives will too. what arrogance. or perhaps it is really naivety. no one ever thinks that they will be the perpetually single one , the divorced one, or the childless one, but these things happen . things do not always go according to plan. this is because we are not in control. h-shem is. internalizing this truth is easier said than done. i recently saw the documentary bully which documents several children who have been bullied. some of these children were so emotionally battered from the abuse that they went as far as taking their own lives . it is heartbreaking to watch . if you have ever been the victim of bullying you know how real the pain can be. fortunately i never experienced the extent of bullying these children had, but i experienced enough to know how awful it can be. a lot of kids don't tell their parents so they aren't defended. sometimes the schools do not help the bullied even when parents tell them this is going on. some children do not know how to stick up for themselves, and need help learning how to. this still does not justify the bully. it is not acceptable to blame the victim. these are children. there needs to be a way to teach respect for others. this documentary was about public schools, but bullying happens everywhere even in adulthood which is even more dangerous. some who are bullied can't take it anymore and try to harm others. one little girl who was bullied could not take it anymore and held her school bus hostage at gunpoint. no one was harmed, but why should a child be pushed so far that she feels this is the only way to defend herself from others? often there is not just one bully but many who are bullying one victim. how does one defend oneself then? the schools need to buck up and stop these bullies. a child should not feel afraid to go to school. it should not have taken an extreme like having to make a documentary to make people get up and look inward at how one treats one's fellow man. yes it comes down to v'ahavta l'rayacha kamocha. love your neighbor. loving your neighbor means respecting others even if they are not exactly like you are. there is an anti-bullying movement out there that basicly is saying that people need to wake up and treat each other properly. i just love this sentiment. it is sad that such tragedies have had to happen to make people introspective, but if change really happens then these tragedies will not be in vain. will this happen over night? no , but i believe that if this project prevents just one child from taking his/her own life this project will have been successful. if this project stops just one kid from becoming a bully it will have been successful. Jdate and Facebook are probably more successful at finding dates than singles are on these sites. If you are looking for trouble you will find it . News flash , people were having affairs way before the Internet and Facebook existed. people often comment about how they love new yorkers who say what they feel without any filter. they feel like they are being "real" . well i for one would prefer "fake" to real if beastliness is considered honest. new yorkers love bargains as well and it doesn't cost anything to be courteous. its better to be "fake" nice if it doesn't hurt another person's feelings in the process. i have friends who favor vacations that only requirment is sitting on the beach and sunning themselves. i am not so into sunburns, but i can relate to the sentiment. when i am on vacation i enjoy sitting around and reading , crocheting , eating and little else. my usual days are spent spinning like a dreidel (i know wrong holiday) so when i finally have some down time i like to be as immobile as possible. currently i am on my pesach vacation. the most strenuous thing i have been doing is munching on matzah. life is good. check this out on the dry bones blog the Dry Bones Blog for the fifth question. p.s. i realize that this photo is juvenile, but i just had to post it. i am wishing everyone a chag kasher v'sameach. i am not sure how much i will be able to post over the holiday as i won't always be near a computer. i thought that i would share this photo . it gave me a chuckle , hopefully you will chuckle too. i just finished reading condoleeza rice's book extraordinary ordinary people. it is a her memoir. it is quite fascinating. condoleeza rice was born in birmingham , alabama in 1954 . segragation was alive and well in the southern united states and was especially strong in birmingham, alabama. she was the only child of middle class black teachers/professors. she is a pianist who became interested in politics after taking a political science class in college in denver from a course taught by josef korbel who was madeliene albright's father. madeleine albright was at studying at columbia at the time. rice's parents moved her to denver when she was a teenager as they found teaching jobs there. bentzion netanyahu was a professor at the university of denver who also lived in the apartment complex her parents lived in . he invited rice and her family to the first seder she ever attended. later, in the political arena rice would always send regards to bibi's father whenever she would see him. though i was aware that rice was secretary state i did not think much about it which is why this autobiography was so delightfully informative. it is so well written. her journey is so inspirational. i highly recommend this book. my father's yahrtzeit is coming up soon. its hard to believe that it has been two years since his passing. when someone that close passes it effects a person in ways one would not believe until one experiences it. it forces a person to face up to mortality. its not an easy thing to experience. fortunately or unfortunately there are many to commiserate with once one has experienced the death of a parent. its a club one never asked to join, but one is a member of nonetheless. the cloud is now gone and it is time to remember those who have passed with light instead of darkness. i was walking down ocean parkway last night and i found some cool plaques on the street. its amazing what one can find when one stops to pay attention. foster flounder, parkville puffer and newkirk needlefish. oy vey. 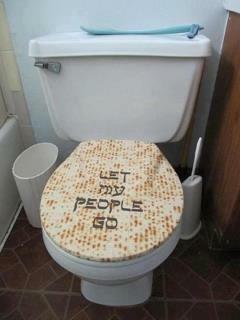 no gefilte fish.